Ensuring your tile and natural stone flooring looks brand new after years of use is not only relatively easy, but also simple with proper care. While cleaning the tile and natural stone flooring once in a week is crucial, removing dust and dirt particles whenever they appear on the floor is also vital to enhance the life of your flooring. Moreover, a clean and sparkling stone floor also improves the mood and productivity due to the visual appeal it brings with itself. Thus, for those looking for a complete guide on how to keep their tile and stone flooring brand new even after years of extensive use, here is a complete step by step guide (which even men can easily follow). Before you begin cleaning the surface of your floor, remove all the loose debris lying on the floor with any ordinary broom you might have available in the house. You can also choose to handpick the loose debris lying around before bringing life back into your flooring. After you have cleared the flooring from all the loose debris or trash lying around, it’s time to sweep and mop every bit of soft dust particle off of your flooring. 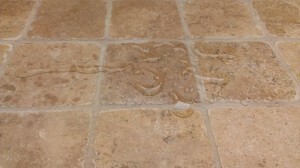 Here, an individual can choose to use either a fluffy broom or a dust mop to clean the surface; however, the person sweeping the floor must pay special attention to the areas between the tiles and remove the dirt often hidden in the thin border like areas where the stones and tiles meet. Once you have removed all the dusty particles from the floor, it is time to clean the flooring with water. To clean the tile and natural stone flooring with water, a person should get a bucket filled with water, preferably hot, and dip the mop into the bucket. Once the mop is wet, squeeze the excess amount of water out of the mop and have it run over the flooring. Again, when running the wet mop over the stone flooring, special attention must be paid to the areas where the stones meet and join each other. Moreover, the mop should also be dipped inside the bucket of water every time it is dried up. If your tile and natural stone flooring has any tough and robust stains on it, you can have them removed with a good brand of liquid dish soap. In the bucket of water, pour a bit of liquid dish soap and, once again, dip the mop in the bucket before running in on the tough stains. Although cleaning your tile and stone flooring may seem like an easy process, it is important to have the floor cleaned by professionals once every few months. While it is possible to clean the flooring by yourself and practice the DIY approach, a modern household is normally not equipped with the expensive hardware required to really give a tile and stone flooring a brand new sparkling look. Hence, at Advanced Surface Solutions, we recommend individuals to clean their floors by the above mentioned guide once every week; however, we also suggest you opt for professional natural stone cleaning services once every few months to obtain a shiny new look.